The flag at a north-west London air base, which was the command centre during the Battle of Britain, has been lowered for the last time. RAF Bentley Priory, in Stanmore, was Fighter Command headquarters during the four-month battle with the Luftwaffe to counter aerial attacks in 1940. The base will undergo restoration and become a museum, opening in 2010. Many who witnessed milestones at the base were present as the RAF ensign was lowered in Friday's closing ceremony. During the past month all operations were moved to RAF Northolt in north-west London. Mary Hulse, who was with RAF intelligence during the battle and attended Friday's ceremony, said: "You had the naval officer, the army, all the people around the balcony watching all the plotting. It was all fantastically busy all the time." Flight Lieutenant William Walker said: "I think its terribly sad. I have been coming here for several years and so many friends, and many of them are now dead. But I shall never forget the memories." About 550 officers died in the 1940 battle, which helped avert the invasion of Britain. 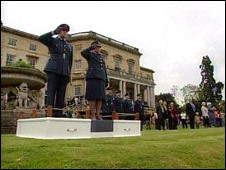 RAF Bentley Priory also played a central role during the D-Day Normandy landings. King George VI, Prime Minister Winston Churchill and US General Dwight Eisenhower monitored the landings from the Allied Expeditionary Air Force War Room, the bunker which was constructed under Bentley Priory. After the war it remained a Command and Group Headquarters responsible for the defence of UK airspace until 2000.